Although the flowers are beautiful but those have a very unpleasant odour. For this reason, the species have been named foetida. Interestingly, flowers have no petals! Fruit is boat-shaped, woody, red in color, smooth outside, fibrous inside, 1-5 in a group, 10-12 cm long and 5-8 cm wide. Seeds 10-25, 2 cm long, black in color. The tree is propagated from seeds. It originally grew from the equatorial region of Africa to Australia. 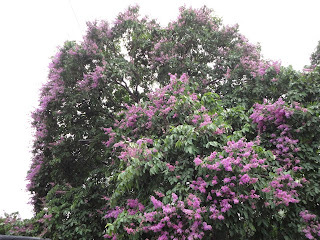 As an ornamental tree it is planted in Park and gardens in Bangladesh. It is mainly found in the coastal areas of the country. Raw seed is edible and very nutritious and tasty indded. It tastes almost like Peanut. It is used as purgative. Rope is made of its bark. Box badam is the another name of the plant.